A year ago we built a version of magpie, our learning recommendations engine, targeted at learning professionals. We worked with Blue Eskimo to develop role terminology that fitted our colleagues in L&D, and used the Learning & Performance Institute's capability map to inform our skills framework. And we sourced and curated a library of free resources (articles, videos, courses) from which to make recommendations. Usage has grown steadily and now there are now over 2000 L&D professionals using the product. We thought it would be interesting to share a little about how L&D people have been using the instance. In this blog I’ll focus on the skills that L&D people are engaging with. One difficulty we have when we analyse the skills our users value is that we are offering them prioritised recommendations in the first place. Our users are much more likely to accept recommendations from the top of our prioritised grid than from trays further down. So our usage statistics are seen through this lens. To adjust for this when we compare engagement with different skills, we use a technique employed by Slack’s search team - we give more weight to engagement from further down our prioritised recommendations than we do to user activity at the top of it. 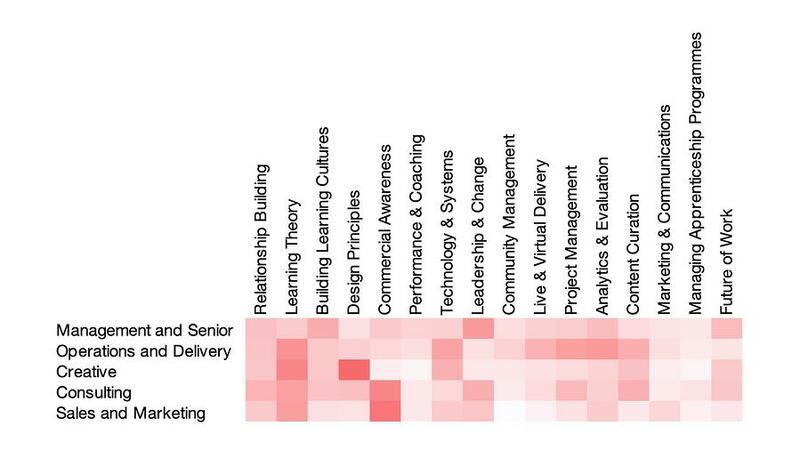 This heat map shows where engagement (browsing, launching assets, bookmarking them, completing etc) has been strong in L&D magpie. 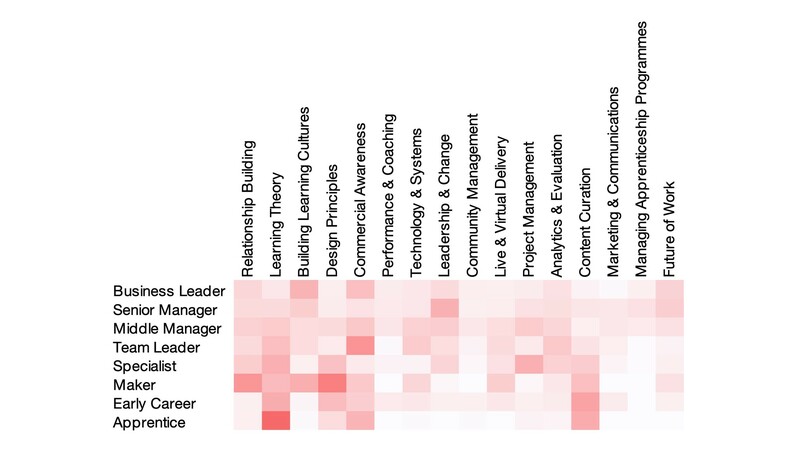 Across the way are the skills in our L&D magpie framework; vertically are the various areas of specialism our L&D people have identified with. First up, there are some reassuring confirmations of our expectations. People working in Creative functions are strongly engaged with Design Principles and Learning Theory. Consultants and sales-people focus on Commercial Awareness. Senior L&D-ers are preoccupied with Leadership & Change. But there’s another layer of insight beneath that. Leadership & Change is also particularly important to Consultants; Analytics & Evaluation is a focus for senior teams and for Operations and Delivery, but not front of mind in Consulting. Taking another cut across the same data, this chart shows how engagement varies by seniority of role. In this case the lack of engagement with Performance & Coaching content stood out, as did the interest in Learning Theory across the seniority spectrum. What might this kind of analysis could mean for your organisation across many functions? Could this sort of aggregated insight into the curiosity and interests of the workforce inform your content and platform strategy? In future we’ll be diving into a bit more detail, and sharing content recommendations L&D people have found particularly useful over the last 12 months. In the meantime and as always, keen to hear your thoughts, get in touch with me via @filtered_chris or LinkedIn. And if you haven’t already, please sign up to L&D magpie and let us know what you think.